Posted Monday, December 30th, 2013 by Steve Leigh. As mobile devices become an integral part of our lives, companies like Epson continue to find new ways to integrate with these devices. Standards like AirPrint cover some of the most popular smartphones and tablets. Epson seems to have found a niche, however, by supporting smaller devices like the Kindle Fire and the Chromebook with easy printing solutions. This will make their products that much more appealing to owners of devices like Kindle Fire tablets and Chromebooks. Printing from a tablet or a reader is certainly nothing new. As mentioned, solutions like AirPrint have offered this feature for iPads and other devices for several years. Some devices, like the Kindle Fire, have continually lacked any printing capabilities. Since the Kindle started as an e-reader, printing wasn’t such a concern. Now that it has morphed into more of a full-blown tablet with the Kindle Fire, however, users have begun to expect more functionality. 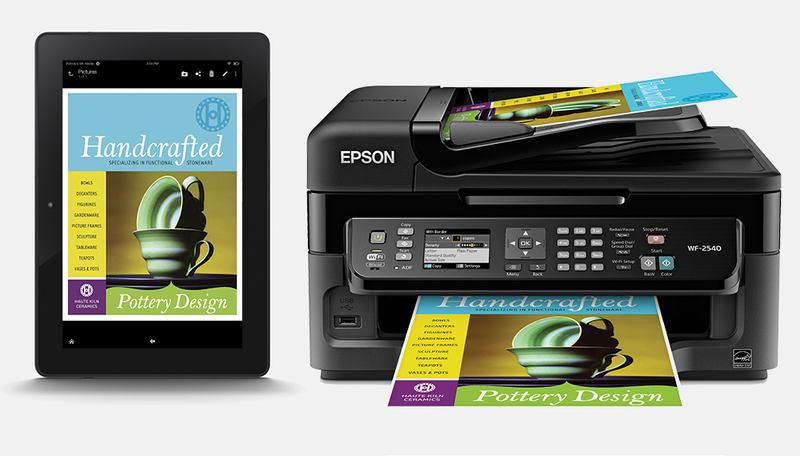 At the beginning of December, Epson announced that several of its wireless printers will now support the Kindle Fire. This is made possible by the Fire OS 3.1 update, which lets users find nearby wireless printers. With an update to the Epson Connect platform, printing from a Kindle Fire will now be a matter of a few taps. Office Documents – With the free OfficeSuite App included from Amazon, documents will be easy to preview, edit, and print. Photos – Users can now print photos from their albums, and from the we. They can also snap a quick photo with the Kindle Fire’s camera and easily print it with only a few taps. Organization – With great apps for email, calendar, and contacts, the Kindle Fire has become a hub of productivity. Need to print entries from your contact list, or an email from a friend? Now it’s easy with an Epson printer. The Kindle Fire isn’t the only device getting some extra attention. Epson recently announced support for easy printing from the Google Chromebook, though it is much less widespread. In fact, support for the Chromebook is currently limited to only one Epson printer: the Epson Expression Premium XP-610 model. This model is also exclusive to Best Buy stores, so this might make it a difficult purchase for some buyers. Nevertheless, for owners of the Chromebook, the simple, no-setup printing method should be very appealing. It also marks a unique way for Epson to stand out from the crowd. Chromebook printing isn’t the XP-610’s only claim to fame, though. In fact, this lightweight device can handle a wide range of photo printing features as well as scanning and faxing tasks. It supports wireless networking, with advanced features like duplexing included as well. The touch panel has a 2.5-inch screen that is perfect for correcting photos before printing, and in addition to the Chromebook, users can print from Apple iOS devices, Android devices, digital memory cards, and more. Its four Epson ink cartridges are also relatively inexpensive to replace. By advertising its easy printing support for products like the Chromebook and the Kindle Fire, Epson is putting its products front and center for device owners. While these features may not appeal to a broad audience, you can bet that Kindle Fire and Chromebook owners will greatly appreciate them. They can now print easily, with virtually no setup, just as those with an iOS device have been doing for years.